These are used with floor mounted double acting door “springs” and consist of a steel base with a brass “strap” for the heel of the door to fit into. They come in six widths and either brass or satin chrome finishes. We make these for Security Closures. 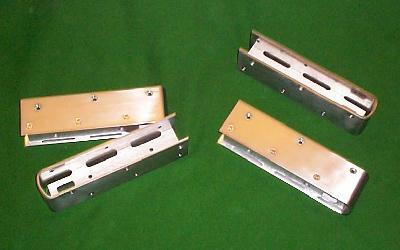 Retractable Door Top Pivots and Cover Plates(in Stainless Steel or Brass) used in conjunction with floor mounted door closers (“springs”) and door “shoes” as shown above - Also for Security Closures.